Asma Nabeel, Head of Films at Crew Motion Pictures in profile. Asma Nabeel needs no introduction. Yet sadly, even a strong woman in a man’s world goes unrecognised – and Nabeel is as strong as they come. She has 17 years worth of experience in advertising and she has made her mark at some of Pakistan’s biggest agencies. She has battled cancer and emerged victorious and now her sights are set on conquering the production side of the arts; drama and film to be more specific. Before interviewing Nabeel I had checked out her track record and was already in awe of her. I walked into her office expecting someone much older, only to be met by an attractive and confident woman, who introduced herself with a firm handshake. Before we started she excused herself to make a few quick calls, there and then going into ‘mom mode’, as she checked in with her children about the rest of their day. This done, she turned and said: “Okay, so let’s start this interview with a confession. Yes, Nabeel, the advertising hotshot did not dream about being in advertising. Her dream was to become a doctor and not any doctor. Coming from an army background, she saw herself as an army doctor decked out in a crisp khaki sari. She says she was both fascinated by the army and the uniform. Fate, however, had different plans and her medical dreams were quashed when her family moved to Karachi and her father passed away soon after. In those circumstances, her mother was reluctant to allow her youngest child to go to Jhelum, where the Military College was located, to study there. This sudden change threw her off course, leaving her feeling demotivated, directionless and disoriented. That was when her elder sister stepped in and suggested she apply to Karachi University for a degree in Mass Communication. Half-heartedly she agreed to give it a try, as she had no other plans. What she had not realised was that she had a knack for writing poetry and catchy lines; she also enjoyed the journalism aspect of her course. She graduated with flying colours and entered advertising where she would go on to prove not only her skill at writing, but her abilities as a team player and a leader. Starting as a copywriter at Manhattan Leo Burnett she made her way up the ladder to ECD; her journey in advertising took her to some of Pakistan’s big name agencies, such as IAL, JWT, Orientm McCann and Walter. Among these agencies, her stint at Orientm McCann was the most significant; it had just opened up and she was entrusted by her CEO, Masood Hashmi to set up a creative department from scratch. She remained at Orientm McCann for seven years, her longest stint at an agency. Her last position was at Walter and this turned out to be her shortest stint and her last job in advertising. When I asked her why she so suddenly left a profession she had been associated with for so long, she replied that having been in advertising for so long she had come to the conclusion that she had said the same things in so many different ways and fatigue had set in. She did not see herself moving forward, adding, at the risk of offending people on the brand side, that the maturity level is not there, which is why many senior ad people end up moving into a different field where they have more control over what they do. In advertising, she says there is strong dictation; it is either yes or no, with hardly any room for negotiation or ifs and buts. Added to this she had developed an interest in scriptwriting and a film project was on the horizon. When the project came through, she joined Crew Motion Pictures as a partner. 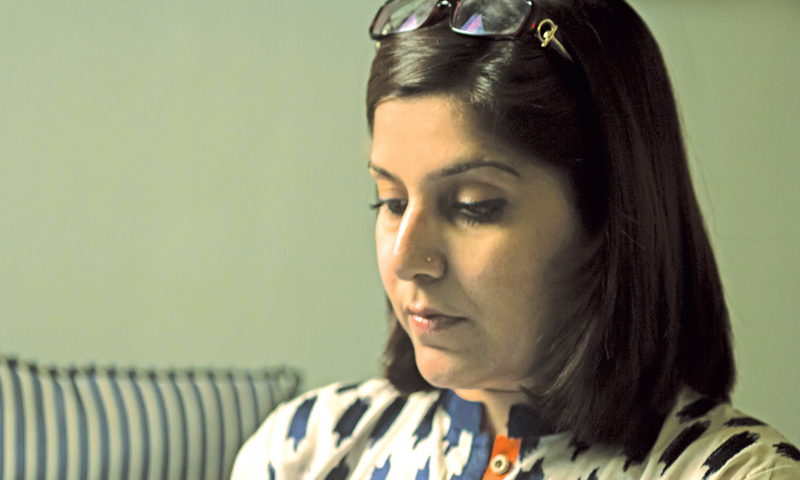 Married with two children, Nabeel believes one has to create the work-life balance oneself. Obviously, there are sacrifices and it is tough when one is a parent. In her opinion, you have to work out what you are willing to let go. For example, weekends are reserved entirely for her children and there is absolutely no compromise there. By now, I know she is unstoppable. Yet, as she told me there was a point in her life where she almost stopped. While at Orientm McCann she was diagnosed with cancer and this changed the dynamics of her life. Until then she had been a very impatient person and wanted everything NOW. After that experience, her perspective changed; she realised that whatever will be, will be, and that no amount of worrying or trying will make things happen. Not one to be dragged down by life, with the support of her friends, family and her boss, Masood Hashmi, she continued to work throughout her treatment. As Head of Films at Crew Motion Pictures, Nabeel is relishing the change of pace and especially not working according to a set formula. The current revival of Pakistani films has been particularly exciting, especially because of there is now the prospect of a stream of new projects coming up. Whether she is talking about her current job or her time in advertising, you can feel the passion that drives Nabeel. She brings authority to what she says. She believes women should be passionate about their careers and confident about their aspirations. In her view, there are no obstacles for women, in fact she is ready to vouch that being a woman in a male dominated field need not be a hindrance, unless one chooses to believe that it is so. She says no one has challenged or questioned her ability to lead because she’s a woman because she always dealt with work issues confidently and assertively and never gave anyone the opportunity to use the fact that she is a woman to judge her. Khizra Munir is CEO, CoPakistan. Thank you for sharing her interview, and wish her best of luck for the new career. i am sure a person with such skills and capabilities can achieve anything they are passionate about.